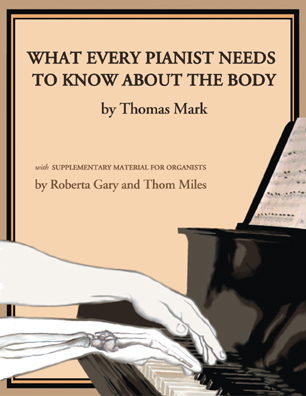 What Every Pianist Needs to Know about the Body is not a book about piano technique. It is a book about the body. It offers a wealth of information about bodily structure and free movement, covering such topics as the core support of the body and the places of balance, the suspension of the arm structure, movements of the joints of the arm and hand, and much more. Though rarely taught, and not part of traditional piano pedagogy, this information is vital for pianists. Using the powerful tool of body mapping, the book explains how this information relates to piano playing. It describes sitting in balance to permit enhanced freedom of the arms (and avoid shoulder and back pain), tension-free pedaling, and the anatomy of forearm rotation. It offers a detailed discussion of the wrist and elbow joints, which is vital for pianists who suffer from (or worry about) carpal tunnel syndrome or tendonitis. Throughout the book, detailed illustrations supplement and illuminate the text. The book contains numerous practical suggestions on how to develop improved habits of movement. It describes the most common habits that can be the source of limitation or injury. Pianists who assimilate this information into their body maps can avoid or recover from injury. In addition, whether injured or not, they can achieve new levels of freedom, security and expressivity in their playing. The book includes special sections for organists by Thom Miles and Roberta Gary. What Every Pianist Needs to Know about the Body is available in a Chinese edition. Learn about the Chinese edition. Another site from which to purchase the Chinese edition. What Every Pianist Needs to Know about the Body is available in a Korean edition, published by Joongangart Publishing. The Korean edition can be ordered from this Korean Bookstore. What Every Pianist Needs to Know about the Body is available in a Japanese edition. Read the publisher's description of the Japanese edition, or order online. "This is simply the best book presently on the market for understanding and acquiring the principles of healthful, injury-preventive keyboard technique. ... a truly laudable contribution to the keyboard profession." "Every pianist, organist, and harpsichordist should read this book; it offers vital information for teachers and students." "Here is a book that can help all players of keyboard instruments avoid injury while playing with the utmost ease of motion. . . . Wisdom and valuable pedagogical advice are evident throughout this book . . . highly recommended."